We're off on another trip; this one will ultimately carry us through, we hope, most of Illinois Route 66 with nice portions of Ohio and thrown in. I'm going to try to post as often as possible from this trip, so that I won't accumulate a daunting backlog of pictures....so, these may be quickie posts with less detail than usual. I'll try to fill in a bit later. 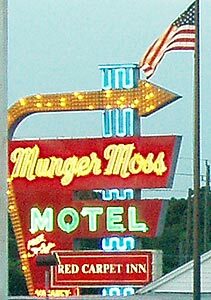 We stopped at the Munger Moss Motel in Lebanon, MO, to pick up a couple books to help us in our journey. The motel is a special place to us because it was the first place at which we shot photos with the intent of blogging, as we reported in this recent post. 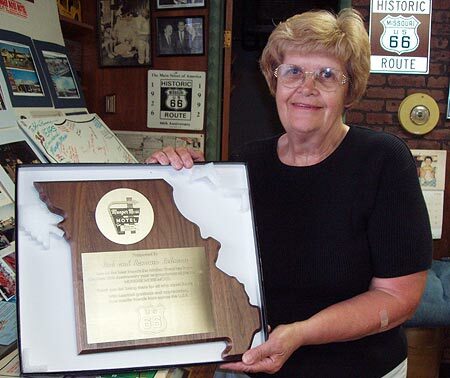 Ramona Lehman, owner of the Munger Moss, shows us the plaque she and her husband, Bob were recently awarded to commemorate the 35th anniversary of their ownership of the motel. 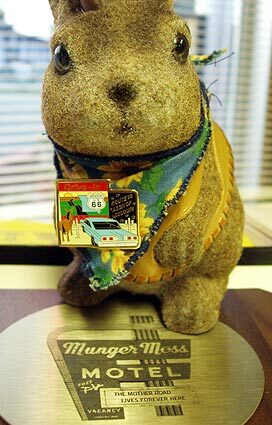 Ace Jackalope models a new Missouri Route 66 pin he bought from Ramona. The pins are $3 and the money goes to the Missouri Route 66 Association. We saw cars at the Wrink's Grocery building just a bit down Route 66 from the Munger Moss. 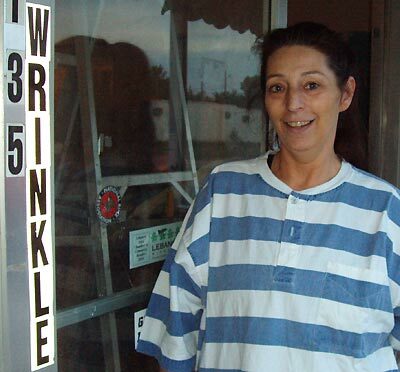 Wrinks has been closed since the death of its owner last year so we just had to investigate. 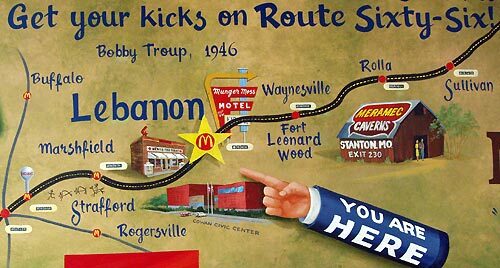 This is a small section of a Route 66 mural at the Lebanon McDonalds. It's amazing how you can be driving along and not have to stop for drinks, gas or restrooms until you see a cool sign at the next exit. 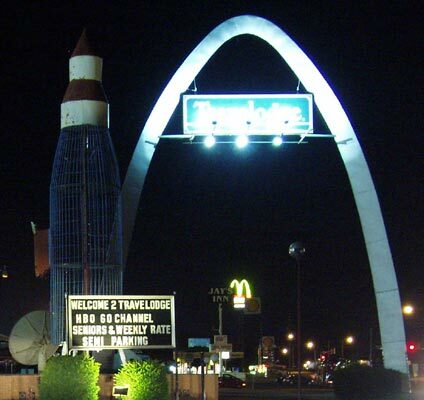 The sign for this Travel Lodge in Vandalia, IL, was obviously inspired by the St Louis Arch...and they have what looks to be the main frame of an old rocket slide too. What would Jesus do? 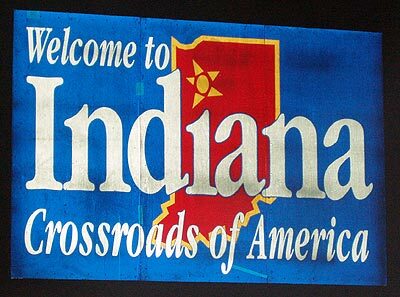 I'm thinking he probably wouldn't stop to shoot a picture of a huge sheet metal cross in Effingham, IL. 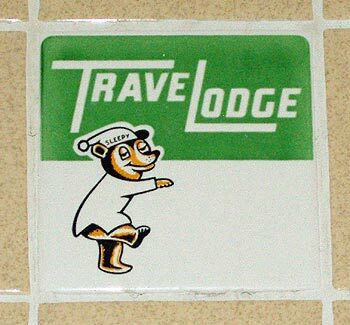 A neat little decorative tile in the shower stall of the Terre Haute, IN, Travel Lodge at which we stayed Friday night was the only neat thing about the place. 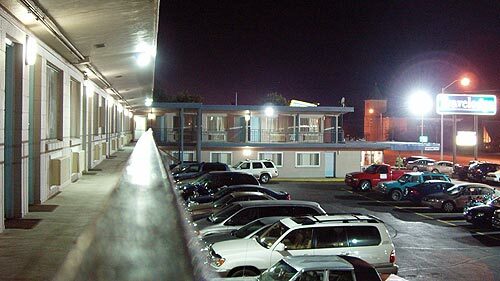 You may have noticed we don't usually say anything bad about a motel; that's because we usually choose well. This choice was a last-minute arrangement and we were lucky to get a room at all on a holiday weekend. That being said, the shower curtain was mildewed, parts of the carpet and walls were dirty and two of the three door locks were broken. Goodnight....hey, is anyone else thinking of the scene at the end of Poltergeist where the father wheels the motel room TV out onto the walkway?